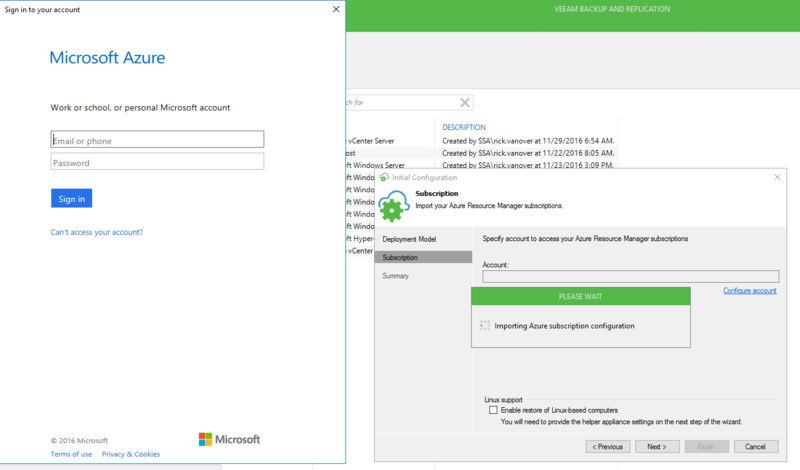 Veeam Backup & Replication 9.5 introduces many new features, one of those being further integration with Microsoft Azure. This is tighter integration is achieved through via Direct Restore to Microsoft Azure. 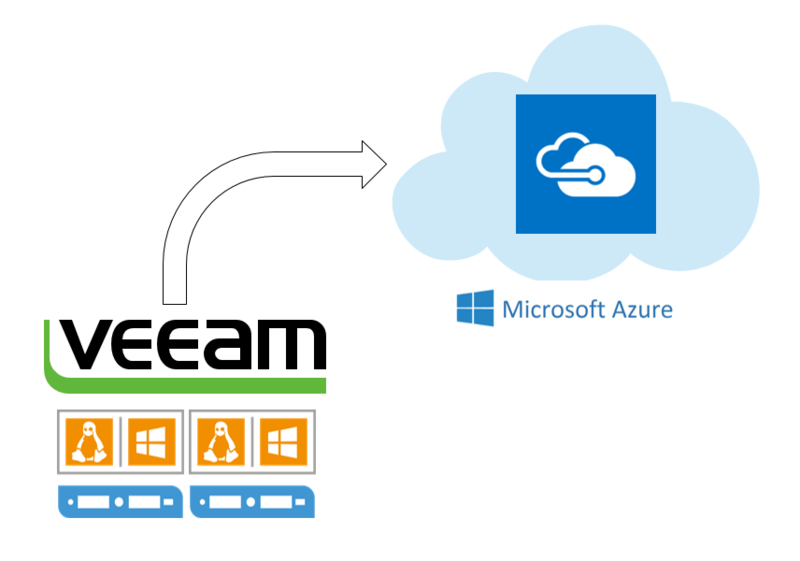 Now, if you follow Veeam closely you will recall in March 2016 that there was a Technology Preview of the Direct Restore to Azure functionality. This tech preview worked with v9 of Backup & Replication (BnR) and was exclusively available through the Azure Marketplace. With 9.5 now GA, the Direct Restore functionality has been integrated into the on-premises UI. Direct Restore to Microsoft Azure is available in ALL product editions (Standard, Enterprise and Enterprise Plus) AND Veeam Backup Free Edition. For more information on all the other features that are new in Veeam Backup & Replication 9.5 be sure to visit the What’s New document. Lets take a look at how to get this setup and running! 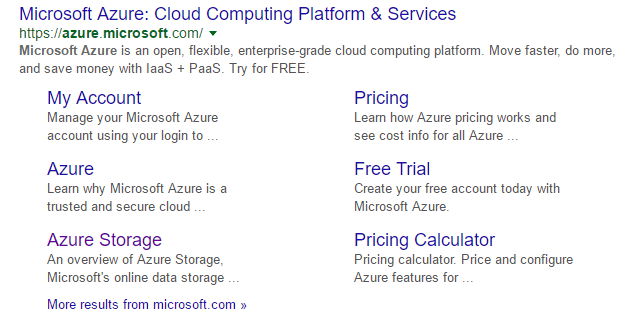 The first thing we’ll need to do is to have an Azure account. 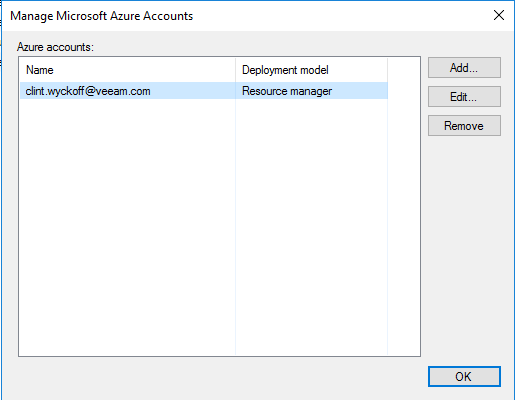 Here we’ll add in our Azure Account, you’ll notice I have already added mine, however to add your account, click Add. 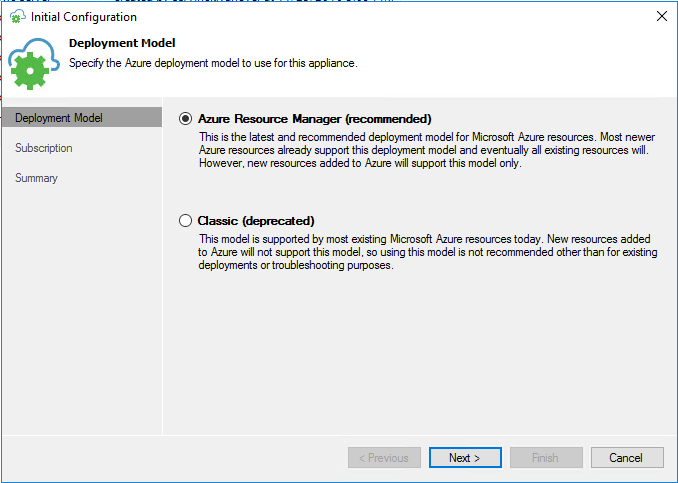 After clicking add you’re prompted to choose your Deployment Model – You should be choosing the Azure Resource Manager (ARM) because the Classic model is being deprecated. Once you click next you’ll see that Veeam will check to see if you have the Azure PowerShell modules installed. If the Azure PowerShell Modules are not present you’re prompted to install them via a URL, or you can manually install via PowerShell ISE. 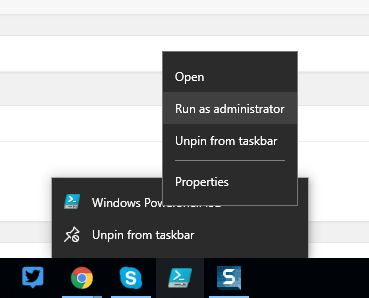 To do so, run PowerShell ISE as an Administrator with the Install-Module commands below. Once the PowerShell Modules for Azure are present you’re prompted to configure credentials to your Azure Subscription. You will notice in this dialog the check box to enable the restoration of Linux-based computers. This helper appliance is deployed automatically to your Azure account and left in a stopped/deallocated state until it is required to be powered on. Check the box to enable the recovery of Linux based computers. Linux Helper Appliance Configuration – Choose your Azure Location, Storage Account, Virtual Network and Subnet – These are all Azure specific settings and you’ll need to make sure that you choose the appropriate configuration. 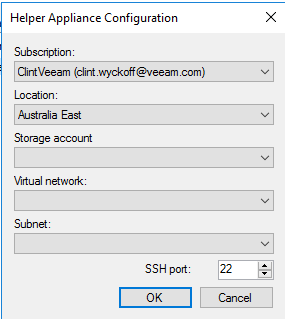 Inside of your Azure Virtual Machines you will now see the Veeam-Proxy-Appliance that is in a Stopped (deallocated) state. This is important because Microsoft does not charge for resources in this state. Now we’re ready to perform quick restores of ANY Veeam backup including Windows and Linux-based VMs, physical servers or endpoints! 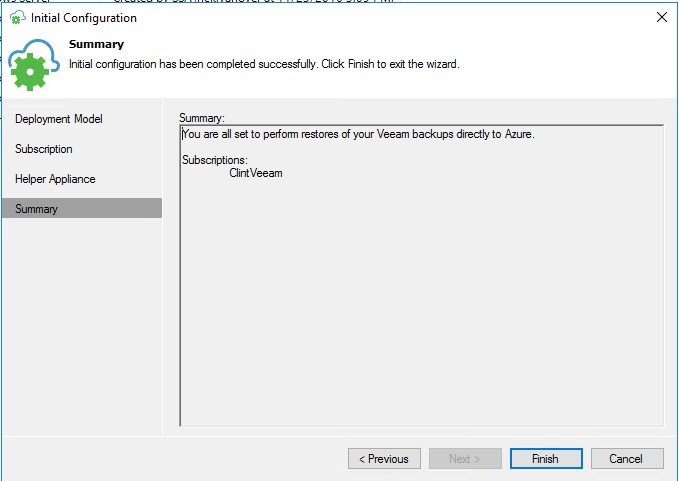 Veeam Backup & Replication 9.5 introduced the ability to directly restore any Veeam backup directly out to your Azure environment. I hope you can see just how simple it is to add your Azure subscription and get ready to do some restores!